The objective of this task was the accurate and consistent prediction of rotor vibratory loads in high speed steady level flight. The key mechanisms behind high-speed rotor vibration were not clearly understood. State of the art predictions in 2000 showed more than 50% error in hub vibratory loads and pitch link loads. The two key problems of articulated rotor (e.g., the UH-60A) aeromechanics were identified as: (i) error in the prediction of advancing blade lift phase (by 30º) and vibratory lift phase (by 180º), and (ii) 50% under-prediction of peak-to-peak pitch link load. The purpose of this research was to resolve these two issues. 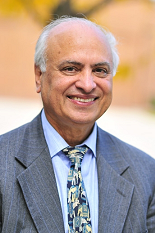 The approach taken was to systematically isolate the physics of structural dynamics, aerodynamics, and trim from the coupled aeroelastic problem. The discrepancies in each were identified, rectified, and the components put them back together again in form of a refined comprehensive analysis (UMARC). First, the key issues in high-speed flight were resolved systematically. Two UH-60A flight conditions (C8534 and C8424) were studied to examine the consistency of predictions. Next, the present task was extended to study two other challenging flight conditions: a high altitude, moderate speed, dynamic stall flight (C9017), and a low speed transition flight (C8513 and a repeat point C8515). The key accomplishments are summarized below. This investigation decoupled the physics of aerodynamics and structural dynamics in high-speed flight. Measured airloads, damper force, and control angles from the UH-60A flight test were used to refine and validate the rotor structural model. Once validated, the resultant blade deformations were used to validate aerodynamic models. Predicted airloads from a lifting-line model were compared with CFD (RANS and Euler) analysis. It was established that inaccurate prediction of the advancing blade lift phase and vibratory airloads at high-speed stemmed from inaccurate aerodynamic modeling, not structural dynamic modeling. Vibratory lift at high speed was caused by: (1) large elastic twist deformations (-8º to -10º near the tip) driven by 3D unsteady transonic pitching moments, and (2) inboard wake interactions on the advancing blade. The dominant phenomenon at the outboard stations (0.865R to 0.99R) was the elastic twist. Vibratory lift at these stations was predominantly at 3p and arise from 2p twist. At the inboard stations (0.675R and 0.775R), the vibratory lift was impulsive in nature and not accurately captured by twist alone. Wake interactions on the advancing side, caused by positive vorticity trailed inboard in the azimuths of negative lift, appeared necessary in addition to twist. Given the correct pitching moments, the structural model predicted the elastic twist with sufficient accuracy needed to capture the vibratory lift harmonics. Accurate twist required accurate pitching moments. 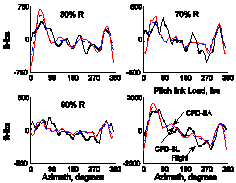 Lifting-line models, with 2D airfoil tables did not predict the 3D shock relief effect on unsteady transonic pitching moments near the tip (0.865R outboard). Both unsteady RANS and Euler analyses calculated the pitching moments satisfactorily at the outboard blade stations. A CFD model (TURNS-free wake) was coupled consistently with a Comprehensive Analysis (UMARC) to improve prediction of helicopter rotor vibratory loads in high speed flight. The two key problems: advancing blade lift phase, and under-prediction of pitch link load, were satisfactorily resolved. The CFD/CA coupling improves elastic twist deformations via accurate pitching moments, and captures the vibratory lift harmonics correctly. At the outboard stations (0.865R out) the vibratory lift is dominated by elastic twist. At the inboard stations (0.675R and 0.775R), a refined wake model (dual peak, or moving vortex) is necessary in addition to accurate twist. The peak-to-peak pitch link load and lower harmonic waveform is accurately captured. Discrepancies in higher harmonic torsion loads remain unresolved even with measured airloads. The predicted flap bending moments show a phase shift of about 10 degrees over the entire rotor azimuth. This error stems from 1, 2 and 3/rev lift. The 1/rev lift is unaffected by CFD coupling. The 2 and 3/rev lift are significantly improved but do not fully resolve the 2 and 3/rev bending moment error. The goal was to gain fundamental understanding of the stall mechanisms involved, and their accurate prediction. The approach was to decouple the physics of structural dynamics and aerodynamics in a high altitude level flight. Measured airloads from flight C9017 were used to validate the structural model. Once validated, the predicted blade deformations are used to calculate airloads. The RANS CFD model was first validated for an oscillating UH-60A airfoil (SC1095). The rotor airloads were then predicted using a Baldwin-Lomax turbulence model. Both partial (single-blade) CFD, and full (multi-blade) CFD with direct wake capture (from Task-UM 3.2) were studied. Finally, the patial CFD was coupled to obtain airloads, blade loads and pitch link loads from first principles. The study showed that the first stall cycle was caused by high trim angles in the retreating blade. The second stall cycle was caused by the elastic twist deformation. CFD wake capture appeared to improve airloads in the advancing side, but did not alter stall predictions in the retreating side. Stall near the tip (0.965R) was not well predicted. The lower harmonics of structural loads (up to 4/rev) were predicted accurately. Discrepancies were noted in higher harmonics of torsion.This discrepancy stems from structural modeling, and was not resolved using the measured airloads. The CFD/CA coupled predictions are now compared with test data and predictions using measured airloads at three level flight conditions. The flight conditions are each characterized by different aerodynamic phenomena – wake at low speed, unsteady transonic pitching moments at high speed, and dynamic stall cycles at high altitude. Each flight is also characterized by a different structural dynamic phenomena – 3p flap bending at low speed, low frequency elastic twist (1,2p) at high speed, and high frequency elastic twist (4,5p) at stall. The predicted flap bending moments are satisfactory at high speed; show a 3p phase error in stall, and up-to 50% under-prediction of 3p magnitude at low speed. The problem appears to stem from the predicted airloads. The predicted torsion loads are satisfactory up to 3p. The 4p and higher harmonics show significant discrepancies (up to 50% error with test data). The problem appears to stem from structural dynamics. The predicted chord bending moments show significant discrepancies in the magnitudes of 4 and 5p harmonics. On an average, the 4p is under-predicted by 50% and the 5p is over-predicted by 50% along the span. Three rotor structural dynamic formulations are compared: multibody, full finite element, and finite element with modal reduction. A swashplate servo model is developed to study the effect of swashplate dynamics on blade loads and for the prediction of servo loads. The measured airloads from the UH-60A flight test are used to compare the predicted loads between the three formulations. The first part of the paper describes and validates the structural dynamics formulations. The focus is on a multibody formulation which is first verified with analytical solutions for beam undergoing large deformation (elastica). Then it is validated with static Princeton Beam deformation test. It is then used to predict the UH-60A structural loads at high speed and dynamic stall flight conditions. 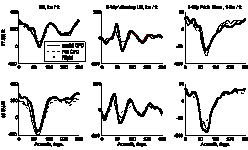 Finally, the multibody formulation is examined for prediction accuracy in comparison to the reduced order models. It is observed that the predicted structural loads for the UH-60A at the two flight conditions, are equally accurate with the three formulations. The second part of the paper describes and validates a three-degree of freedom swashplate-servo model. It was the intent to study the effect of swashplate dynamics of blade loads. It is observed that swashplate dynamics, and the variation of the blade root stiffness due to the swashplate servo geometry have insignificant effects on the accuracy of the blade loads. The accuracy of the servo loads are affected by swashplate dynamics. The high frequency servo loads (8/rev and 12/rev for this rotor) are significantly affected by the swashplate dynamics. The 4/rev servo loads are less affected, and are primarily determined by the accuracy of the pitch link loads.